Colourful well-designed log book with two pages per dive. Whatever happens on your dives they won’t be as colourful as the Ultimate Diver’s Log Book. With 200 high-quality colour pages at a low price this log book is like no other. There are two pages for each dive so there is plenty of room – no more cramped information. Space for 100 dives with two pages per dive. Log depth, time, buddies, gases and consumption. a useful tool if you want very detailed records of your dives” DIVE magazine. 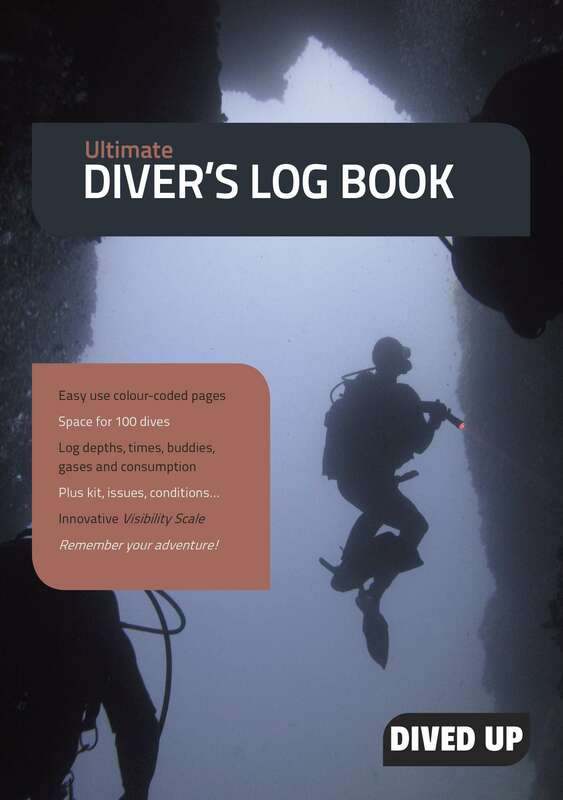 The Ultimate Diver’s Log Book can help speed up logging a dive or ensure you keep every detail you might find useful in future. It has pre-filled units (both metric and imperial). There’s a section to record any kit configuration you want to remember. It can accommodate multiple gas mixes (for the techier ones among us). A guided calculation will also help you work out your breathing rate. The graph paper can be used to draw dive profiles or scale drawings. There’s a large plain area for comments, sketches and stamps. And if anything goes wrong, there’s even a section for that too. The Visibility Scale is a range of colours – circle or tick the one closest to the water colour on the dive. Then compare this with the depth and visibility on other dives. There are also pages at the front for personal details and some lined note pages at the back for general use. The ultimate recreational diver’s log book is the ideal gift for any serious diver.